Reading and share top 22 famous quotes and sayings about Remix by famous authors and people. 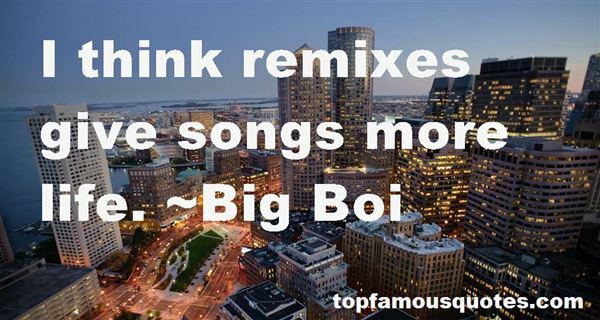 Browse top 22 famous quotes and sayings about Remix by most favorite authors. 1. "Every James Brown cut makes a party get crazy. He's the god of all music. I always play different wild remixes of his songs because people start bugging out when they realise what I'm playing." 2. 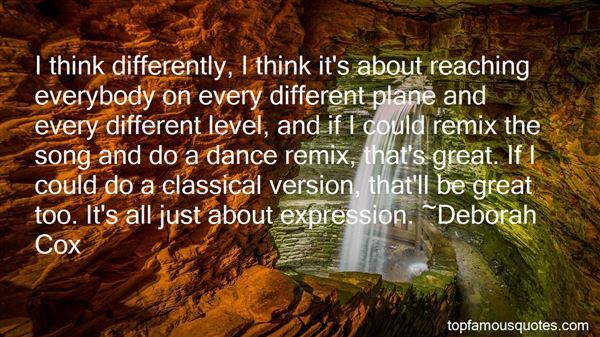 "I like the way remixes sound. Some of them are really creative." 3. "Every new idea is just a mashup or a remix of one or more previous ideas." 4. "My wife cooks. I can't cook. I can remix leftovers pretty good, though." 5. "I think remixes give songs more life." 6. "The judges say, make it your own, so I just remixed a song if I felt like the piece needed it"
7. "I think differently, I think it's about reaching everybody on every different plane and every different level, and if I could remix the song and do a dance remix, that's great. If I could do a classical version, that'll be great too. It's all just about expression." 8. 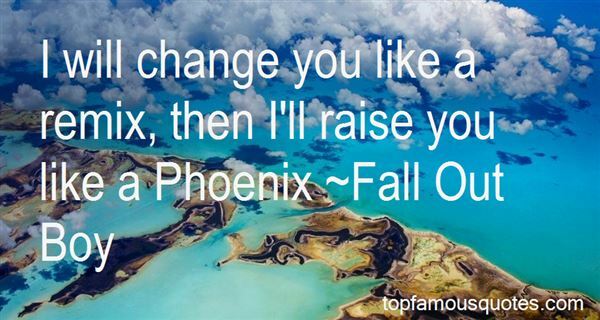 "I will change you like a remix, then I'll raise you like a Phoenix"
9. "With this CD technology, you can just remix a record right there on the spot." 10. "I started a recording studio. I started producing people and doing remixes." 11. "Poetry is never abandon it is only remixed." 12. "Zombies are familiar characters in philosophical thought experiments. They are like people in every way except they have no internal experience.... If there are enough zombies recruited into our world, I worry about the potential for a self-fulfilling prophecy. Maybe if people pretend they are not conscious or do not have free will - or that the cloud of online people is a person; if they pretend there is nothing special about the perspective of the individual - then perhaps we have the power to make it so. We might be able to collectively achieve antimagic. Humans are free. We can commmit suicide for the benefit of a Singularity. We can engineer our genes to better support an imaginary hive mind. We can make culture and journalism into second-rate activities and spend centuries remixing the detritus of the 1960s and other eras from before individual creativity went out of fashion. Or we can believe in ourselves. By chance, it might turn out we are real." 13. "He was weary. Used up. He had been weary for months, for more than a year. In that weariness, in the exhaustion of his spirit, lay the seed of what he was; of what he had become. Of what they had made him, Saladin's men, and all the others as well. Even his own kind. She had cried out for him to beware, when his horse had been hurt, and fallen. And again when he'd stabbed into the boar's throat. He recalled it clearly: "Be careful!" she had cried. "Oh my lord, take care!" But nothing else, past that. Because with the cries of his horse in his head, and the stench of blood in his nostrils, what he killed was no longer a boar. What he was, was no longer a man, but a body, mind, and spirit remade on the anvil of war, remixed in the terrible crucible of a holy insanity." 14. "I promise I'll never tell. ""Don't promise that," he said in an ultraserious voice. "If they try to hurt you and the only way to protect yourself is to tell them what you know about me, then you tell them. Straight off, okay?""No." "Promise me.""No! ""I will possess your heart. "Heat flared along the back of my neck. "What did you say? ""My favorite song. 'I Will Possess Your Heart. '""By Death Cab for Cutie? "He snorted. "No, the little known T.I. Hip-hop remix. Yes, Death Cab for Cutie."... "Why? What's wrong with it? ""Nothing, but it doesn't seem to fit you. It's kind of a sad song." "No it's pure confident. It's not 'I want' or 'I need', none of that crap." He slipped his hand over mine. "It's 'I will. '"A nervous laugh bubbled up. "You will, huh? "His fingers brushed my cheek, then slid into my hair. "I will." 15. "I have got an anthology album out. The American version has got the same mixes but the European version, I remixed them in the studio and added a couple of things that I have always wanted to add." 16. "In a world where discovery is more important than delivery, it's the people who find, remix and direct attention to old stuff that should be rewarded, not the people who deliver it or sit on it waiting for someone to show up." 17. "Johnny made me feel like I was clever without trying to be. And pretty. And valued. He made everything about me seem more special.Like, say I was a song. Well, Johnny made me feel as though I'd been remixed. The melody didn't change, but it wasn't just the same one-dimensional sequence of notes anymore. Instead, he brought out all these harmonies — these low and high notes — that made the music fuller. No more discord or dissonance. Around Johnny, I was the best possible rendition of myself." 18. "I'm remixing an R.E.M. track called 'I've Been High' from their last album, 'Reveal.' It's a beautiful song, but record execs didn't put it out as a single because it didn't sound like the R.E.M. we're used to. So I asked Michael Stipe if I could have the tapes to do a remix, and he agreed." 19. "He taught me that language was rubbery, plastic. It wasn't, as I thought, something you just use, but something you can play with. Words were made up of little bits that could be shuffled, turned back to front, remixed. They could be tucked and folded into other words to produce unexpected things. It was like cookery, like alchemy. Language hid more than it revealed." 20. "I'm not gone remix a record I don't got no love for." 21. "They amaze me most of those remixes. Some of them are crap. But every time I complain, someone comes up and says they are for a different market that you don't understand. Some of the New Order ones are really great, though." 22. "If you remix, people want to tap into your sound. If you keep that to yourself, it makes the sound more special." If some student came up and wanted to know where to study painting, you'd want to suggest someplace, but there's no place. I wouldn't know where to send a student to study."